Bank Indonesia (BI) Representative Office and Solo Inflation Control Team (TPID) learned about food control system in Jakarta, especially in PT. Food Station Tjipinang Jaya.
" They want to know about early warning system (EWS) program "
PT. Food Station Tjipinang Jaya Financial Director, Thomas Hadinata mentioned, this visit wa s done to know about efforts conducted by Jakarta Provincial Government or in this case PT. Food Station Tjipinang Jaya related to food control system. "They want to know about early warning system (EWS) program, especially related to food control system in Jakarta," he said, Thursday (7/12). In this meeting, his side explained about PT. Food Station Tjipinang Jaya's cooperation system with other institutions. For example, his side acts as rice stock controller and also market player until now. As a rice stock controller, his side cooperates with Bulog to ensure rice provision and rice supply stability for Jakartan's consumption needs. "As a market player, we make a contract with farmers, farmer groups, and perform rice trade between regions," he explained. 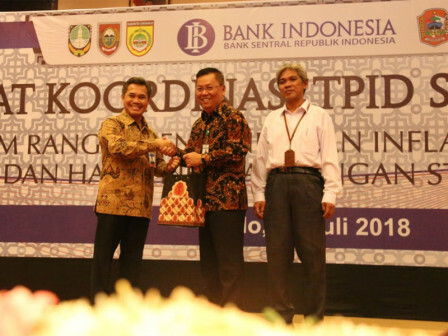 BI Representative Office Head as well as Solo TPID Secretary, Bandoe Widiarto said PT. Food Station Tjipinang Jaya has early warning system (EWS) program to anticipate a surge in inflation through food control system. "Ideally, each regions have an institution similar to BUMD that can provide staple foods for residents and has a strong capital and good management," he mentioned.